Barry wonders how often people think the reason that your friends have come into your life. Some friends you aren't sure that they'll be there, nor do you want them. And some friends, you want them to be more, but for now he'll have to settle for Iris to just be a friend. She's glad he became friends with Cisco and Caitlin, since they saved his lives. Barry tries to make the best of the hot Eddie walking away with his girl Iris, but not even the alcohol is helping. Literally. He takes all the shots on the table, and doesn't feel a thing. Caitlin and Cisco are excited about his super metabolism, but Barry is less so. The building is believed to be secure, but the security guard has no clue how wrong he is. A dark clad figure is about to change his perception. He spots a woman, who warns him not to come near her. With gun raised, he tells her to come to him. She tosses her back pack at him, and the building explodes, knocking some men off their scaffolding. Barry continues to pound the shots, lamenting that at 25 his drinking days are at an end. Eddie and Iris tell Barry and crew that they're up next for the dart board. Eddie gets the bombing call and has to leave, the rest make excuses why they all need to leave. Flash clad Barry spots the window washer. Cisco cautions him that he doesn't have super strength. He wonders about gathering mattresses to catch the man, but Caitlin reminds him that it isn't a roadrunner cartoon they're living in. Barry wonders how fast he'll need to run to go up the side of the building. Cisco gets to calculating. Caitlin tells him to just go really fast and he'll be fine, just be sure to maintain the speed on the way down or he'll go splat. Barry runs all out, and rescues the man. Iris spots the Streak, but Barry keeps his face moving fast so she doesn't see his face. She gets her hair blown back by the Streak. On the scene Barry notes that bombers normally leave a forensic signature. If there's a bomb, Barry can find a clue, but Barry has found no signs of bomb. Joe knows the building didn't just blow up on its own. Eddie reports that the guard said the bomber was a female, but there's no security feed. He did notice that some sort of small charge blasted off a doorknob to a files room. Joe wonders whats missing, and Eddie assumes one of the files in the stacked room. Joe leaves Barry to do his thing, and using superspeed he looks for the missing file. Joe and Eddie return to the precinct to find that the army taking over their case. The girl isn't a civilian, but one of theirs. Joe tells him that he'll send the stuff over, but the General will take it all now. The Captain tells Joe to just give the General what he wants. Barry comes down with a box, and tells him to give General Eiling everything that's relevant. Barry hands over his box, but speedily grabs out a file. Joe gets called away about something in regards to Iris. Joe asks Iris why she was at the scene of the bombing. She tells him that its complicated. Joe tells her that she can't come to every crime scene because she's worried about Eddie. She didn't, she went to see the Streak. She's been collecting information about him and blogging it. Joe tells her that there is no Streak. Iris knows that there is. She thinks that there is something spectacular happening in the city, and she saw him that night, but for now she's off to work, since blogging about the Supernatural doesn't pay the bills. All Barry has is a VA file number on the woman he thinks is the bomber. The army has ordered the police department off the case. Wells knows of General Eiling. He contacted STAR labs in the past to make a super soldier serum with mind reading as the goal. When Wells saw Eiling's techniques, they cut ties, but it wasn't an amicable split. Barry shows him what he found. Lucky for them Cisco was able to find something in the DOD files. They have a contact name, Bette Sans Souci and Barry is off. Barry catches up to the flame haired beauty. He steps to talk to her, and she runs. Barry chases, and Bette puts up a hand to stop him, hitting him in the chest. She warns him to get rid of his clothes quickly. He runs off, and his suit blows up. Barry is unscathed, but slightly naked. 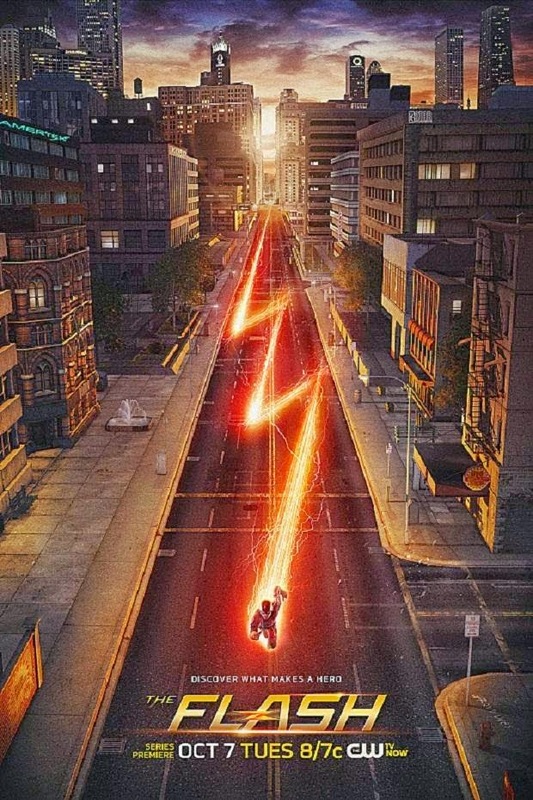 Looks like Barry wears briefs beneath his supersuit. With the suit gone, he's communications are gone. Cisco and Caitlin freak a bit, with contact lost. Barry arrives back. Cisco wants to know where his suit is, and Barry has to break the news that it went kaboom. Bette Sans Souci wasn't carrying bombs, she's a metahuman who makes them with her touch. Wells talks about her bomb via tactile touch. Cisco is ranting about Sans Souci being pure evil and paying for blowing up his tech, until he sees just how beautiful she is. Barry doesn't think that she meant to hurt him, and Wells points out that her abilities are why General Eiling is interested, and why he stole the case from Joe. He didn't want anyone to know what she can do. The group has to find the girl before the General does. Joe takes Barry aside to see when he was going to tell him about Iris seeing the Streak. He hadn't intended for her to see him. He promised Joe he would keep Iris in the dark and to talk her out of writing about the Streak,and he intends for Barry to keep his part of the bargain. Barry races over to convince Iris to give up her Streak Quest. Now that Iris has seen the Streak, she's not letting this go. Between his supersuit, his mask, and the maybe smile he gave her, she can't let it go. It doesn't matter if he wants to be known, he's something special that people want to know about. Iris doesn't understand how he's suddenly against the supernatural when he's been so interested in it all his life. Cisco calls Barry with an update. They have a Sans Souci spotting, she's going after a doctor who operated on her multiple times and General Eiling knows this. The doctor in question gets a visit from Sans Souci as Barry races towards the office. He remembers her, and that's good because she remembers him too. He made her what she is, him, and Eiling. Barry arrives just a second before she's shot by a sniper. She's only wounded. Eiling wants his asset back. Barry tells her that he can help her, and get her out, that he's different like her too. Sans Souci agrees to go with him, and he gets her out of there as the army men go in to collect her. Wells explains what happened when his machine malfunctioned. She was in the city at the time. The dark matter must have combined with the bomb material in her body from the war. She thought that Eiling made her what she was, but its not likely. Eiling isn't smart enough to do something like that. Wells and his crew get to testing her. Her nitrogen levels are off the chart. They need to see what she's capable of to help, but her abilities are too unstable to do that in their location. Caitlin preps Bette for a test, when she notices that she was shot. Bette didn't say anything because she thought she was just grazed, but Caitlin notices something in her arm. She was hit with a tracker, and General Eiling and his men are already in the building. General Eiling notices how the once prestigious lab is a shell of its former self. He wonders how Wells deals with being such a public failure. Wells remains optimistic. He asks what the General wants. He wants the asset that he tracked to the building. Together they could have changed the world, but Wells ruined that. In the remote testing area, Bette throws some frisbees for Caitlin and Cisco as they monitor her readings. She has the same umph as any Plastique, and now a new nickname to boot. Bette tells Barry how she was terrified to touch vehicles during the war when she deployed, and now she's terrified to touch people. Barry assures him that she's in good hands. Cisco and Caitlin both helped him a lot to use his powers not to get rid of them. If he could get rid of his powers, he's not sure that he would. His friend told him that he was gifted with his powers, and he's always wanted to do good, now he can. Joe calls Barry about Iris's latest antics. Not only did she post about the Streak, but now she's signed her name to it, possibly putting her in danger if another Meta-human thinks she's got some inside knowledge. Definitely not good, and Barry has to do something about it. In full Flash gear he pays Iris a little visit. With Cisco's voice scramble and a well placed back light he can talk to her without her knowing his real identity. Iris knew he was real. She thinks that she should clean up, but he beats her to it. He tells her to meet him on the roof, and he'll even give her a head start. When she arrives he's already there. He tells her that he needs her to stop writing about him. The people of the city need hope right now. She tries to interview him, but he isn't forthcoming. He needs her to stop for her own protection, but she points out that she doesn't think that he can stop himself from doing good either. She tells him about well, himself. How people thought he was crazy with all his supernatural talk, but he's suddenly lost faith and the Streak is proof that he was right all along. Iris turns on him, asking him to help her save her friend. Up close Barry is forced to blur his face. He's both super lucky and unlucky. Bette waits for some not so good news. The shrapnel in her body has merged with her on a dna level. The technology to separate her hasn't been invented yet. She takes it a little toughly. Cisco wonders what now. Barry thinks that Bette should join the team. Caitlin and Wells both think she's too dangerous, but Barry points out that she's the first Meta-human that they've come across not hell-bent on destroying the city. Barry wonders what would have happened had they not found him, he could have been in the same position on the run. Caitlin wants to save her just as badly. Joe is sitting in Barry's office going over Barry's mother's case. Barry tells him how he made friends with a human bomb hoping to save her, but he can't and that he's diagnosed Iris's Streak obsession, its about him. Him, him, not Streak him. Joe points out that Iris would know his voice, and apparently that little voice trick was all Barry, and not some Cisco tech. Joe likes the trick. He's not happy about Iris's involvement, but Barry thinks that the only way to get her to stop is to tell her. He tells her everything, but Joe points out that he hasn't told her everything. It's obvious to everyone, but Iris. Joe has seen it since Barry was old enough to know what love is, and he's been waiting for him to tell her. Wells chats with Bette. He tells her how he would do anything to get back what he lost. She would too. Wells tells her how the good people that were affected are now her flock, and General Eiling will never leave them alone. He gives her her matching orders. Kill Eiling, then she can go home. Barry finds Bette gone, and not too pleased about it. Wells claims that she didn't say where she was headed. General Eiling has Bette surrounded. She tells him that she's ready to give herself up, but he doesn't believe her and has his men draw their weapons. Cisco hacks into the military feed, and reports that Bette is turning herself over to the General. Barry knows that she's not doing any sort of thing, and races off after her. General Eiling knows what sort of asset she could be. With her abilities she could ensure countless victories. All Bette has ever wanted was to make the world a safer place. Bette throws bombs at the General and his men who jump for cover. Barry arrives to stop Bette, and her hesitation allows the General to shoot her. She tries to tell Barry Wells's involvement but dies before she gets the chance. Barry calls in the bad news, and how Bette's body is now glowing. She's going to detonate. Barry runs Bette's body across the water, and away from the city. He races against time to get her body far enough where it won't be of harm to anyone. General Eiling does a news interview claiming that the Army was just conducting an exercise, and that the city is in no danger. He murdered Bette right in front of Barry, and there will be no legal repercussions for it. Caitlin tries to make light of the situation telling Barry he's in good company with his new walking on water trick. Barry arrives at Iris's home. She tells him if he's there to do laundry, she already has a load in. He's there to talk. He tells her that he was working a case, he really thought he could help a friend, but she died. He didn't know her that well, but it still hurt. He knows that losing family would have been worse. He warns Iris that putting her name on the Streak stuff puts her in danger, and he asks again for her to stop. She needs him to tell her why she's the only one interested. He tells her that he's finally put the stuff with his family behind, and he needs her to do the same. She may have started because of him, but she's not stopping until the world believes in the Streak too. Barry thinks that maybe they shouldn't see each other for awhile, and Iris agrees. Barry stops for a club soda, and Team Flash comes for a drink. Barry reminds him that alcohol no longer works on him. Caitlin has made Barry a special drink, thinking that he'd need it tonight. It works for a few seconds, but not much more. Barry is left to ponder why some people come into our lives and stay, and why some go. Some friendships feel everlasting, and some fleeting, ending far too soon. Some friendships aren't meant to last a life time, only the pain of their loss. Which Iris is definitely feeling at the moment. General Eiling pays Wells a visit. Again Well is one step ahead of him. Eiling thinks that they should work together again, but Wells will have no such thing happen. Eiling threatens him with a miliatry presence, but Wells fires back threatening media exposure for his inhumane acts, and worse. Eiling isn't going quietly though. He thinks he has Wells figured out, warning that it won't be long until more know. Five years ago when ties were cut it was over the cruel treatment of a test subject. Wells refused to allow Eiling to hurt him any further. Wells goes in to tell the man-beast Grodd that Eiling is gone, and that he has a whole different future in mind for him.